Happy Wednesday everyone! Hope your week is off to a great start! Today I'm sharing a look I'm just obsessed with and wear on regular rotation throughout the fall. If you've been following Sweet and Sauer for a while you know these are hands DOWN my favorite pants ever. I won't bore you with more gushing over just how awesome they are. However, one of my favorite ways to wear them (or any leather/pleather) pants is with a denim shirt and a statement shoe. 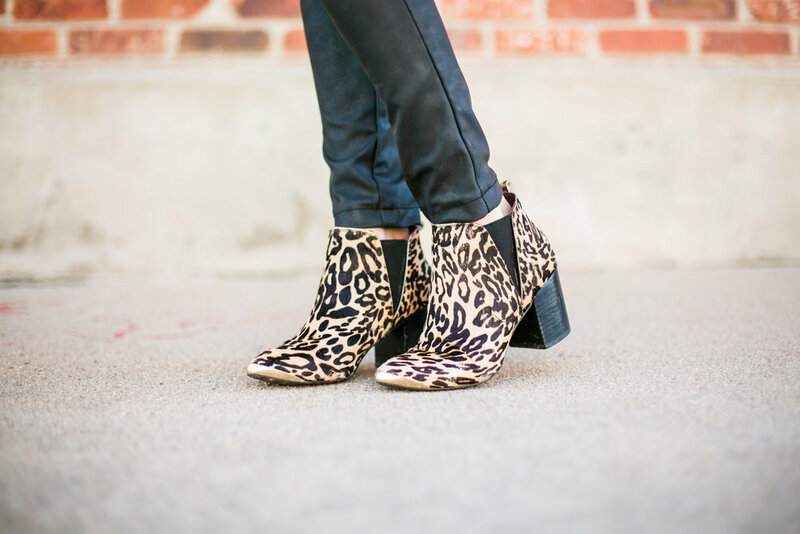 Leopard booties were a big trend last season and they seem to be here to stay, and let me tell you, I am on board. This look is perfect for work, and will take you straight to happy hour seamlessly. Just change up your lip color and swap your bag for a cute clutch and voila!